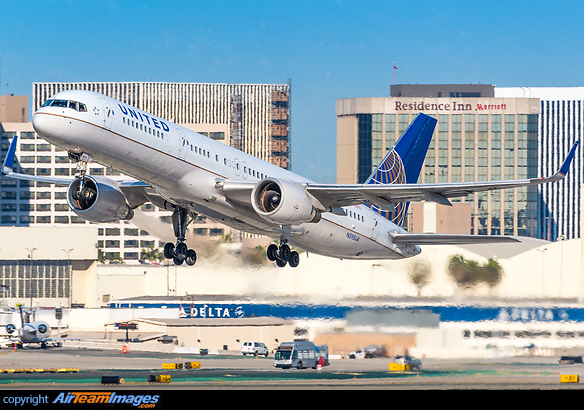 The Boeing 757 is a medium range narrow body passenger airliner. It was the successor to the B727, with the same fuselage cross section, but the airframe was redesigned with underwing fan engines. The 757 was developed in tandem with the 767. 200 was original, standard passenger version, production ended in 2004. 2 x Pratt & Whitney PW2000 (41700 lbf) or Rolls Royce RB211-535 Series (37000 - 43100 lbf) turbofan engines. Used 211-535C at 37400 lb or RB211-535E4 at 40100 lb, alternatively PW2037 at 38200 lb, or PW2040 at 41700 lb.